Listing the Pinneys found in historical references is probably naive considering that many of the references found are of alternate spellings of the name and also considering that the task is truly never complete. This list should be limited to settlers of new areas and Pinneys that hold some significance in history. The listings will be organized by the year in which they are first referenced. There is a reference to a John Pynne and a Robert Pynne in 1398 in Yarmouth in a document called "Register of the Hospital of St. Mary: A Calendar. "24 This work is a listing of tenants of the Hospital of St. Mary in Yarmouth, England. This listing is the earliest reference to the surname that has yet to be seen by the author. These same men seem to be listed as parliamentary burgesses for Colchester, Ipswich, Lynn, Maldon, and Yarmouth in England30. These same Pynnes of Yarmouth are mentioned in a quotation from Stephen Alsford's site, Medieval English Towns31. "Obstructionism and bureaucratic red tape conspired to confound judicial investigations. Robert Pynne, searcher of ships at Yarmouth in 1440, was accused by the controller there of failing to record most of the forfeits of one arrested cargo, since he intended to keep the goods for his own profit. In 1447/8 he and kinsman John Pynne were charged with complicity in a wool-smuggling operation, and Robert was also said to have used his position as bailiff to obstruct the commission of enquiry." Humphrey Pinney of Broadway, Somerset, England traveled along with 139 other passengers from the West Country of England to New England in 1630 via Plymouth, England and helped to form the towns Dorchester, Massachusetts and Windsor, Connecticut35. This crew traveled aboard the William and Mary. According to some information, Humphrey Pinney and his descendants still account for a majority if not all of the Pinneys is the United States of America. Nathaniel Pinney (1640-1676) a native of Windsor Connecticut, was the best friend and "White Brother" of Uncas the Mohegan a Native American who rejected his father's leadership of the Piquot tribe and formed his own tribe, The Mohegans. Uncas is the subject of the book, "The Last of the Mohicans." by James Fenimore Cooper. Nathaniel was the son of Humphrey Pinney, the first known Pinney to settle in North America46. An extraordinary thing happened to Azariah Pinney in this year. The Duke of Monmouth was denied his birthright and decided to use his power and military force to create a rebellion that would provide him with the recognition he felt he deserved. The rebellion was quickly squashed and approximately 200 participants were sentenced to death by hanging32. Azariah Pinney was a party to the rebellion at Sedgemoor and also happened to be the son of a minister and part of a family involved in lace making. Azariah's sister paid a bribe to the Lord Chief Justice George Jeffreys, in order to spare his life. At the age of 24 Azariah was exiled to the British colony in Nevis in the West Indies and was able to buy his way out of indentured service and pursue the profitable sugar trade38. He was unfortunately party to the history of slave trading and exploitation. There are still remnants of his grand plantation by the name of Mountravers on the island of Nevis33. Azariah died around 1720 as a very wealthy man. Historical significance may be questionable, but an interesting story surrounds the Pinneys of the UK. John Frederick Pinney, the grandson of Azariah Pinney who was involved in the Monmouth rebellion, was raised in the British Isles and lived in Bettiscombe House or Manor near Lyme Regis, Dorset. John inherited the significant plantation on the island of Nevis in the West Indies and was to his credit appalled by the institution of slavery and refused to stay on and pursue the sugar trade. He instead offered the plantation, as well as Bettiscombe Manor and Racedown Lodge of Dorset, to a cousin, John Pretor in exchange for adopting the name Pinney as his own. On returning to Dorset John Frederick Pinney supposedly brought a male slave back to Bettiscombe Manor. A skull still remains in this house that is said to belong to the slave. This skull has been dubbed the "Screaming Skull" and is purported to protest whenever it is removed from the house by emitting a scream that relentlessly disturbs the household34. A great deal of misinformation seems to surround this story, but nonetheless it is an intriguing link to history of the Pinney family. The American Revolution brought many American Pinneys into action. ABNER PINNEY (1750-1804) a native of Simsbury Conn, served during the Revolutionary war as a drummer in the 18th regiment, Connecticut Militia. ABRAHAM PINNEY (1750-1804) a native of Simsbury Conn, was a Lieutenant at the Battle of Lexington. ELEAZER PINNEY (1753-1804) a native of Ellington Conn, was a Sergeant in the Burgoyne Campaign. ISAAC PINNEY (1741-1832) a native of Windsor Conn, was a Private in the Connecticut Line. ISAAC PINNEY (1716-1790) a native of Windsor Conn, was a Captain in the Connecticut Line46. In this year William Wordsworth came to live and care for a son of John (Pretor) Pinney, one Azariah Pinney 1775-1803. Azariah suffered from tuberculosis and Wordsworth had cared for a friend of his, William Godwin44. Wordsworth came to live in Racedown Lodge in Dorset with his sister Dorothy Wordsworth. The two lived there from October of 1795 on through 179742. 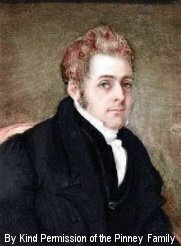 John Frederick Pinney II an older brother of Azariah's also knew Wordsworth through this association. Samuel Coleridge came to visit William Wordsworth in June of 179743. There was evidently some friction between the two Pinney brothers and their father, John (Pretor) Pinney. Their father was first and foremost an obsessive business man and bookkeeper and simply couldn't accept that a young man might stay rent free in his property. The brothers persuaded their father to allow the Wordsworths to stay. Wordsworth also taught Azariah Pinney's son Greek and Latin44. Wordsworth was twenty-five years of age in 1795 and had already fathered a child in France. Many of his early published works were produced during this intriguing interaction with the Pinneys of Dorset. Riot broke out in Bristol on October 29th of this year while Charles Pinney (pictured in the portrait to the left) was the mayor. The riots began when Sir Charles Wetherell entered Bristol. Wetherell was active in the rejection of the emancipation of Roman Catholics through the Reform Bill and when he entered Bristol he was mobbed by the people. Mayor Pinney read the Riot Act three times before the Mansion-House, Queen Square was burned down and his life was in danger. He fled the city and the military charged the city and killed 16 people and injured one hundred. There is some controversy as to the way in which the ordeal was handled by the Mayor. Charles was placed on trial on the 25th of October in 1832 for neglect of duty in his office as mayor of Bristol. He was judged not guilty and later chosen as an alderman in the reformed corporation45. 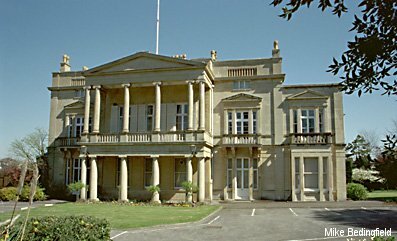 Photo of Camp House, Clifton a home built for Charles Pinney in Bristol.